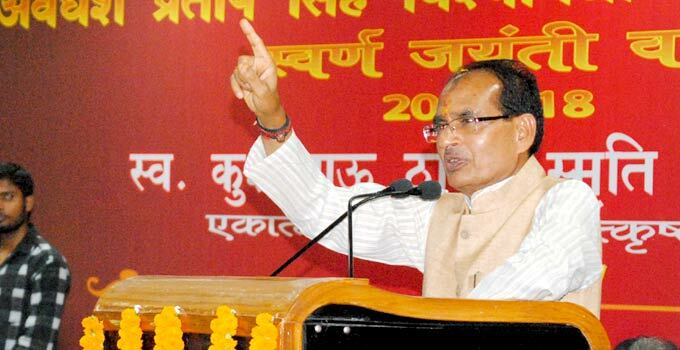 Bhopal: Speaking at the Kushabhau Thakre Memorial lecture series organized on the occasion of the golden jubilee of Avdhesh Pratap Singh University, Rewa here today Chief Minister Shri Shivraj Singh Chouhan said that integral humanism is the basic mantra behind all the joys of life. Expressing his views on Ekatma Manavvad Utkrishta Bharat Shri Chouhan said that the resolve to build a new India can be fulfilled by imbibing nature. He said that the principle of integral humanism given by Pandit Deendayal Upadhyaya, is to work for the welfare of the person on the tail-end of the society. In our democracy also, the principle of “Janata ka-Janata ke liye” has been implemented and Sare Jahan se achcha Hindustan hamara is its outcome. Shri Chouhan said that Pt. Deendayal Upadhyaya had taught us that we can stay happy by following the path of Bharatiya Darshan, thoughts and thinking. The joy of body, heart, intellect and soul is what makes man happy. He said that economic empowerment is must for Utkrisht Bharat Nirman. Thus we should make an effort to increase GDP growth rate. The Chief Minister said that Prime Minister Shri Narendra Modi has implemented important schemes for the country’s economic strengthening. Such campaigns, programmes and schemes are being run in Madhya Pradesh so that the state could be made resourceful. CM Shri Chouhan announced to open Bagheli language department in Avdhesh Pratap Singh University, Kushabhau Thakre Vidya Kendra, Pandit Deendayal Upadhyaya research centre and duly running of the Happiness Department in the University. The Chief Minister laid the foundation stone of construction works worth Rs 9 crore 61 lakhs on the occasion. Shri Chouhan planted saplings in the university premises. Enforcing upon the subject at the lecture series, senior thinker and social worker Shri Bhagwat Sharan Mathur called upon the people to become a participant in the building a new India through integral humanism. Late Deendayal Upadhyaya considered the service of the poor on the basis of spiritual Varna Vyavastha (Four classes of Society) as the basic foundation. This is the eternal truth. At the onset, Vice-Chancellor Professor K.N. Singh Yadav gave information about the activities conducted by the university. Professor S.L. Agrawal read out the biography of Kushabhau Thakre. Industry Minister Shri Rajendra Shukla, MP Shri Janardhan Mishra, Mayor Sushri Mamta Gupta, District Panchayat President Shri Abhay Mishra, MLA Shrimati Neelam Mishra, Shri Narayan Tripathi, Shri Ramlal Rautel, eminent personalities, elite and students were present during the programme. Guests were honoured with shawls, sreephal and mementos at the conclusion of the programme.